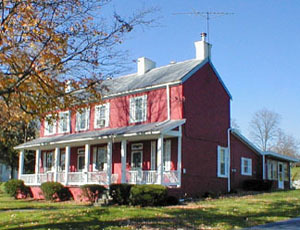 Stories handed down over the generations relate the old brick residence located on Dayton-Xenia Road near the intersection of Beaver Valley Road as being an Inn and Stage Coach stop. Travelers headed north to Yellow Springs or east to Xenia, or west to Dayton, would stop at the inn, which also had a livery stable near the house itself. Riders would change horses at the stable, which reportedly had stalls for 12 to 14 horses. In later years, this became a blacksmith shop for Charlie Johannes, who purchased the property in the early 1900s. Built beside an Indian trail, and also thought to have been a slave trail, the house has a small dirt dugout with a small entrance door under the living room floor; it could easily have hidden three or four people. Folklore of the area includes the story that Abraham Lincoln once stayed overnight at the inn, while he was touring the area on his presidential campaign. This fact, however, was never substantiated. It is known that the inn was built about 1810 by Frank Stoll, who is buried in the Old Beaver Cemetery on Dayton-Xenia Road. Built in the vernacular style, or somewhat different from the accepted architecture of that day, the residence was constructed of brick, as a two-story building in a rectangular shape, and with a gable tin roof. The house had a raised portico with wooden pillars across the facade; there were two entries on the front with glass transoms. All windows had twelve panes of glass. There were two chimneys, one at each end of the house, and three stairways leading to the second floor. The original stone steps and old hitching post can still be seen today at the front of the property. In the early days, a large porch stretched across the rear of the building; this was later enclosed and made into an additional bedroom and a new kitchen. This property was also known as the first high school for Beavercreek. In the year 1887, while a new high school was being constructed at the corner of Factory and Dayton-Xenia Roads, classes for the 20 or so pupils were held in an upstairs room of the Inn. Late in the following year, the students transferred their books and equipment to the new building just up the road. Note: Sources include Chester and Dorothy Puckett (former owners of the property at 2358 Dayton-Xenia Road) and Clarence Johannes, a descendant of the Johannes family. According to 2012 county records, the property is currently owned by Dennis Puckett of Florida and is for sale on the real estate market.